The long awaited post about the Rain Garden installation at St. Paul's is here! 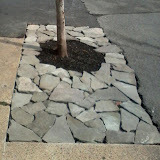 On May 31st, 2014, the NJ Tree Foundation arrived at St. Paul's Lutheran Church near the 5 Corners, to create a beautiful, natural stormwater infiltration system aka a rain garden. The 5 foot by 50 foot garden will collect rain runoff from the adjacent parking lot. It will capture about 700 gallons per storm or about 25,000 gallons a year. That is a lot of water they are keeping out of Jersey City's ancient, and regularly overflowing combined sewer system! Here is the rain garden with the installation team and members of St. Paul's and SJC. During excavation and planting, NJ Tree Foundation educated community volunteers both orally and through hands-on experience on creating and planting the rain garden. It was a fun filled day with the DJ spinning tunes and shovels in the ground. See more pictures here. SJC couldn't be happier about how this project turned out. This was the first time crowd-scourced funding on ioby.org was used to get our grass-roots efforts physically into the ground. The over-arching idea of using green infrastructure to reduce our flooding and CSO problem is really gaining traction both around the country and in Jersey City. In fact, SJC has partnered with P.S. 5 to turn some of their great rain capturing ideas into reality. Please help us reach our goal of raising $6,000 to install 80 feet of rain garden planters in front of the school and a 300 gallon rain barrel collecting water from the roof. This is a great learning opportunity for the students and larger community. It opens the conversation up as to what individuals can do to help solve these water management problems. PS#5’s work has also earned them the Bronze award with National Wildlife Federation’s Eco-Schools USA program which supports and recognizes schools efforts to integrate sustainability into the curriculum and school grounds. Also, PS#5 Eco-Cougars were named National Finalists in the Siemens' "We Can Change the World" challenge. They were one of three schools in New Jersey to be awarded this honor. Additional resources on how you can partner with SJC and ioby to fund your project check out our ioby Partnership page. Lots of information about rain gardens, green infrastructure and a whole lot more can be found on our Resources page. How much water do young street trees need? More water than their standard tree pits can soak up during a rain storm. Building manager Cheryl Russo was tired of watering the young trees out front, and noticed that when it rained, large amounts of rainwater traveled unused down the sidewalk and into the street gutter. This gave her a brilliant idea - make the tree pits bigger to capture more water! Genius - let nature do the work. The "Tree Rain Garden Project" is at 2 Union Street in the Bergen Lafayette neighborhood of Jersey City. With a consultation from friend Steven Latham, Cheryl was able to capture rainwater for the well-being of the property's street trees and other plantings, while also creating a more attractive property border. That is three benefits in one simple project - self watering trees, more beautiful site, and less stormwater going into the city's sewers. See the slideshow below for step by step walk through of the installation of the extended tree pit. Now if only more property owners would let alone take care of their trees, but help capture stormwater before it enters the city's combined sewer system. On a large scale, it would reduce flooding and sewer overflows into the surrounding rivers. Thanks for setting an example Cheryl and Steven! If you would like to contact Cheryl or Steven for more information about their project, please email them at cherylvision[at]aol[dot]com or stevlath[at]gmail[dot]com.